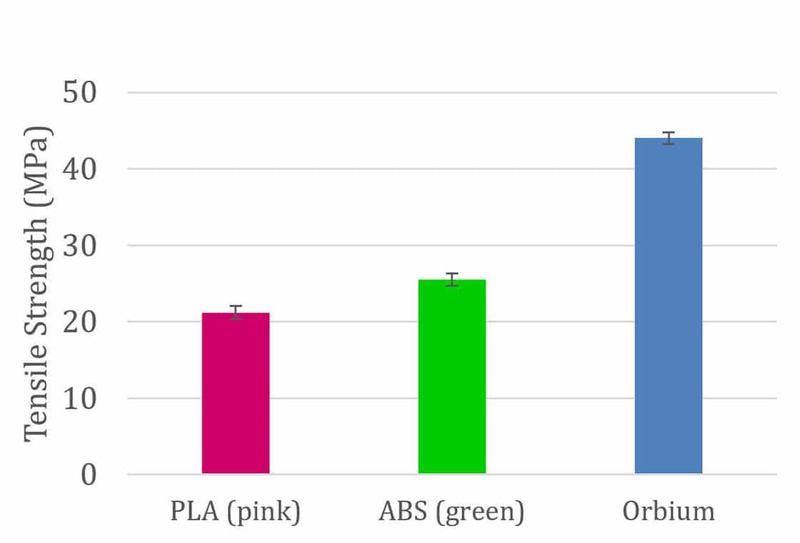 OrbiumTM filament was sent to a testing facility for independent comparison testing against PLA and ABS. All test specimens were printed by Spyder 3D® under the same conditions using a horizontal build orientation. The parts were all printed with a raster fill at a 45° angle relative to the part and an alternating 90° layer. Tensile bars and notched IZOD specimens were used to test the toughness of the filament with as-printed test bars and not secondary machinery. The basic idea of a tensile test is to place a sample of material between two fixtures called “grips” which clamp the material. While one side remains stationary, the other pulls the material apart. Weights are slowly and continuously added to see how far the material can be pulled. by grips on either side that slowly pull the material apart. While Tensile Strength tests how far the material can be pulled, tensile elongation at break tests for how much strain must be put on the sample before it breaks. Tensile Modulus measures the material’s abilities to return to its original form after undergoing stress and deformations. The “stress” is brought upon by hanging weights on the material. Notched Izod Impact is a single point test that measures a material’s resistance to impact from a swinging pendulum. How many hits can this material take? This is a quick and easy quality control check to determine if a material meets specific impact properties or to compare materials for general toughness. 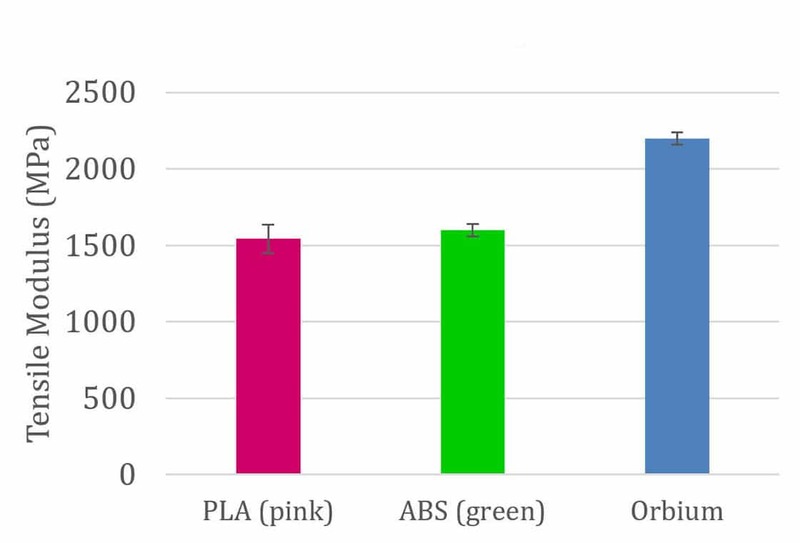 OrbiumTM tested to have more flexibility than PLA and ABS. 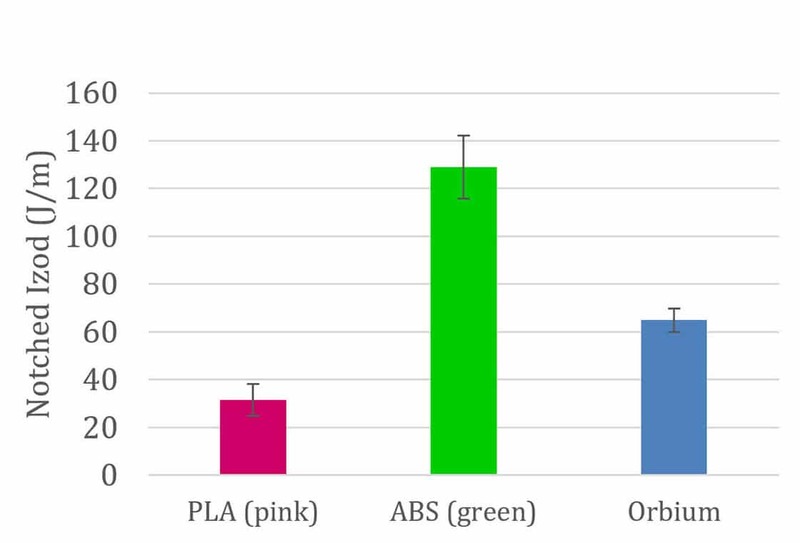 OrbiumTM had twice the tensile strength than PLA and ABS. OrbiumTM had returned to its original form after undergoing the stress and deformations of hanging weights. 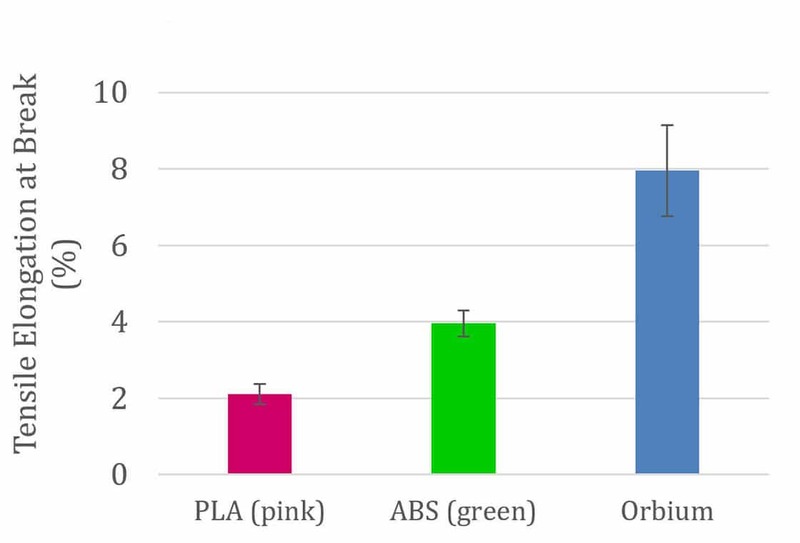 OrbiumTM resulted in a higher notched IZOD than PLA. Spyder 3D®’s Digital Innovation Studio provides students with the necessary tools to bring their ideas to life. By combining facets of engineering, architecture, art, and business into one cohesive hands-on atmosphere, we’re inspiring a new generation of innovators only limited by their imagination. Copyright © 2018, Spyder3D LLC.